12 I, the Teacher, was king over Israel in Jerusalem. 13 I applied my mind to study and to explore by wisdom all that is done under the heavens. What a heavy burden God has laid on mankind! 14 I have seen all the things that are done under the sun; all of them are meaningless, a chasing after the wind. 15 What is crooked cannot be straightened; what is lacking cannot be counted. 16 I said to myself, “Look, I have increased in wisdom more than anyone who has ruled over Jerusalem before me; I have experienced much of wisdom and knowledge.” 17 Then I applied myself to the understanding of wisdom, and also of madness and folly, but I learned that this, too, is a chasing after the wind. 18 For with much wisdom comes much sorrow; the more knowledge, the more grief. I’m a knitter and one of the fads in the last couple of years has been the mobius scarf which is knit as a continuous circle with a twist in it. It uses a particular method of knitting that actually begins with a double ring cast-on row joined as a circle in the center of the scarf. As you knit you are adding rows to each side of center without ever turning your work or doing anything other that just knitting round and round over and over. 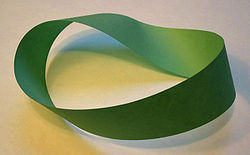 A mobius can be made with a strip of paper with one twist and the ends taped together to form a circle. If an ant were to crawl along the edge of this strip, it would return to its starting point having traveled the entire length of both top and bottom edges of the original strip without ever crossing over the width of the paper strip and not really going anywhere at all. When I read Solomon’s words of frustration, they reminded me of that poor ant on the mobius; going round and round, over and over, without really going anywhere at all. I have a theory about Solomon’s desire to try to figure everything out. It goes back to the Garden of Eden. I think that’s where his frustration began and ours too. The moment those first two people decided they could take access to God’s protected knowledge, everything changed for all of us. The linear journey God had planned for his creation – to walk beside him all our life into possibilities and fullness stretching out before us, got twisted into a mobius-like cycle instead. This entry was posted in Ecclesiastes, Jesus' Words and tagged Ecclesiastes. Bookmark the permalink.